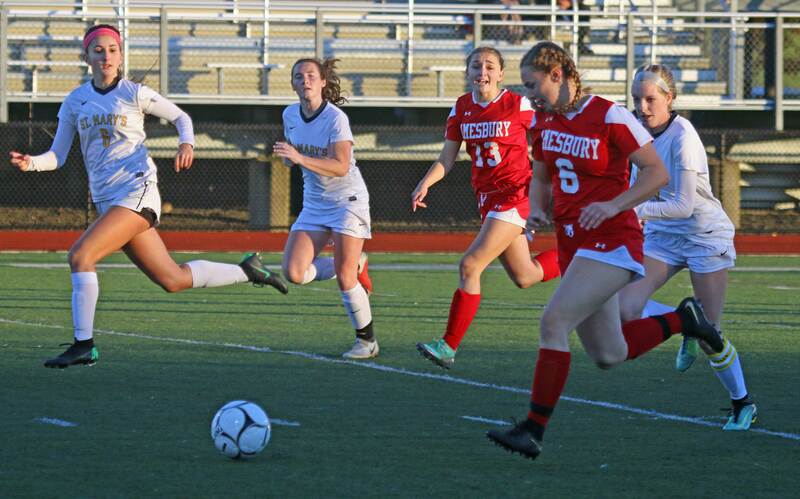 (Lynn MA) Amesbury’s next opponent might want to check to see who hasn’t scored for the #6 Indians so far and keep an eye on them. 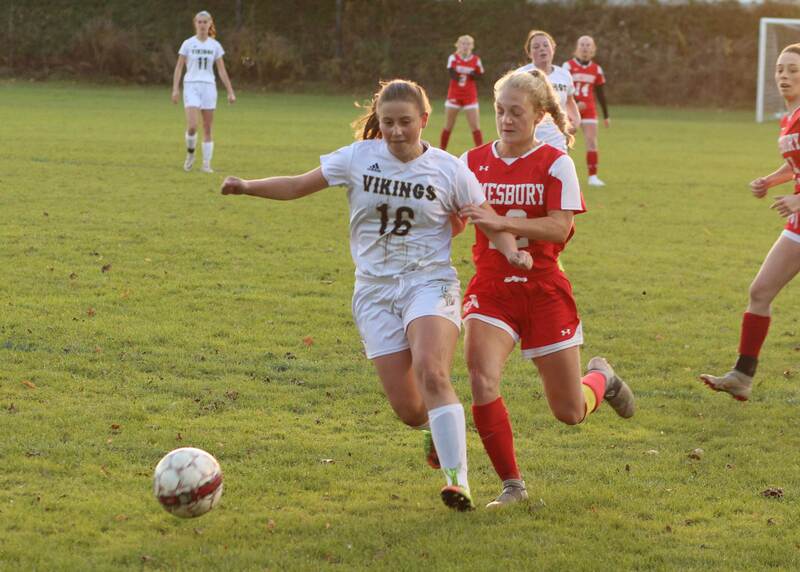 Twice in this year’s D4 tournament, non-scorers have broken through for Amesbury. 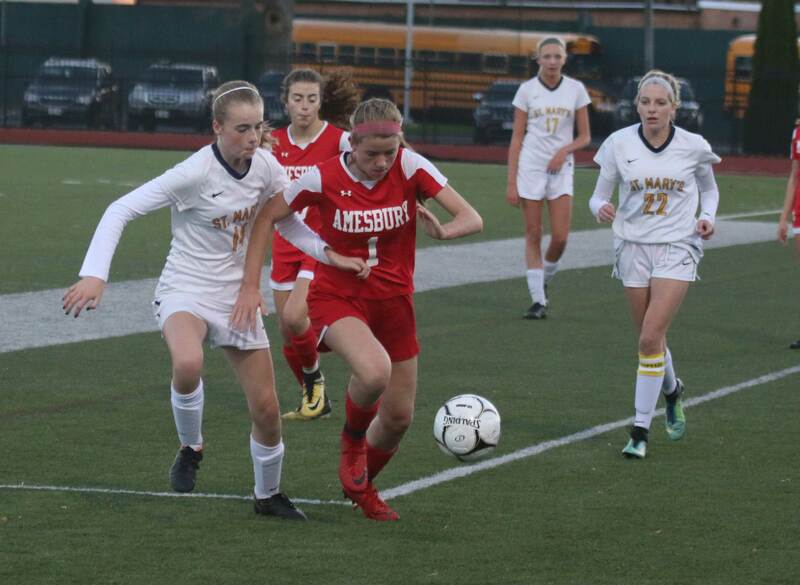 Today in the D4 North semi-finals, it was junior Gracie Doherty. In the D4 North First Round it was senior Sara Johnson. 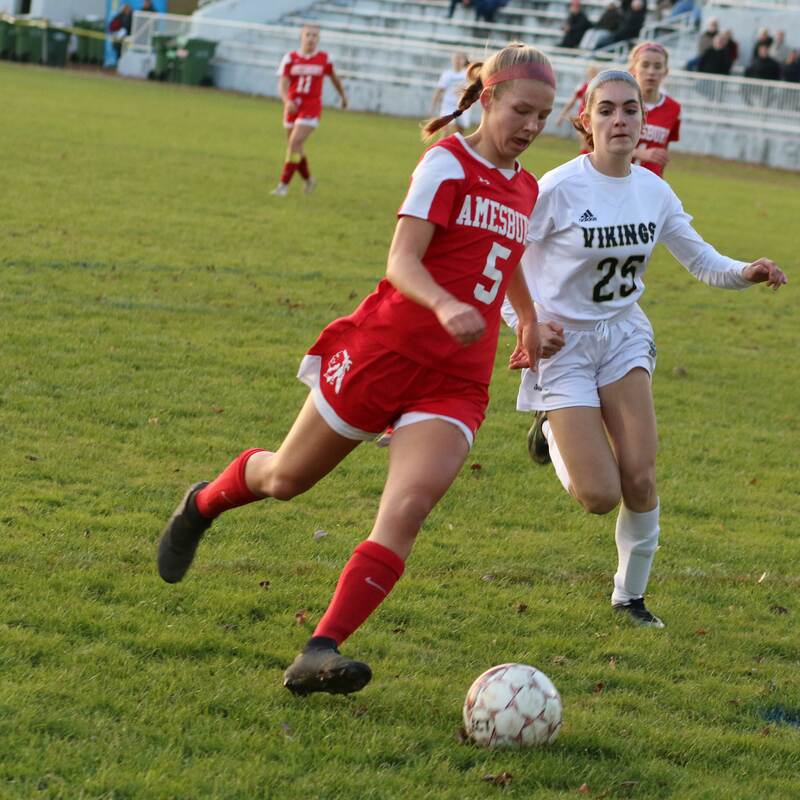 Sara’s goal was part of a 4-0 win over Winthrop. 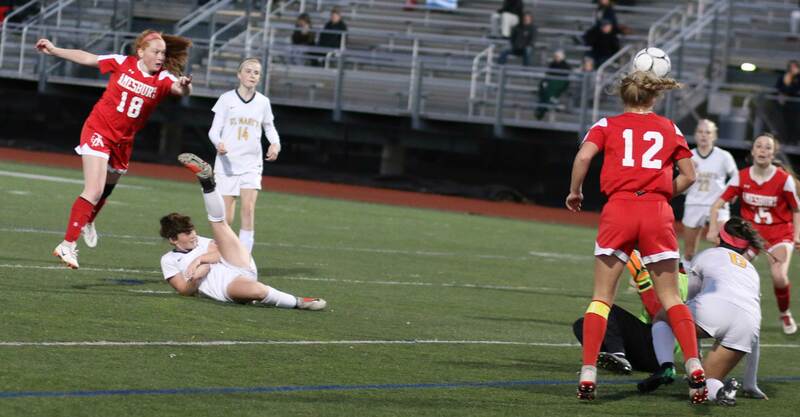 Goalie Alli Napoli on the ground. Kayla Demers in the air. Meg McElaney nearby. 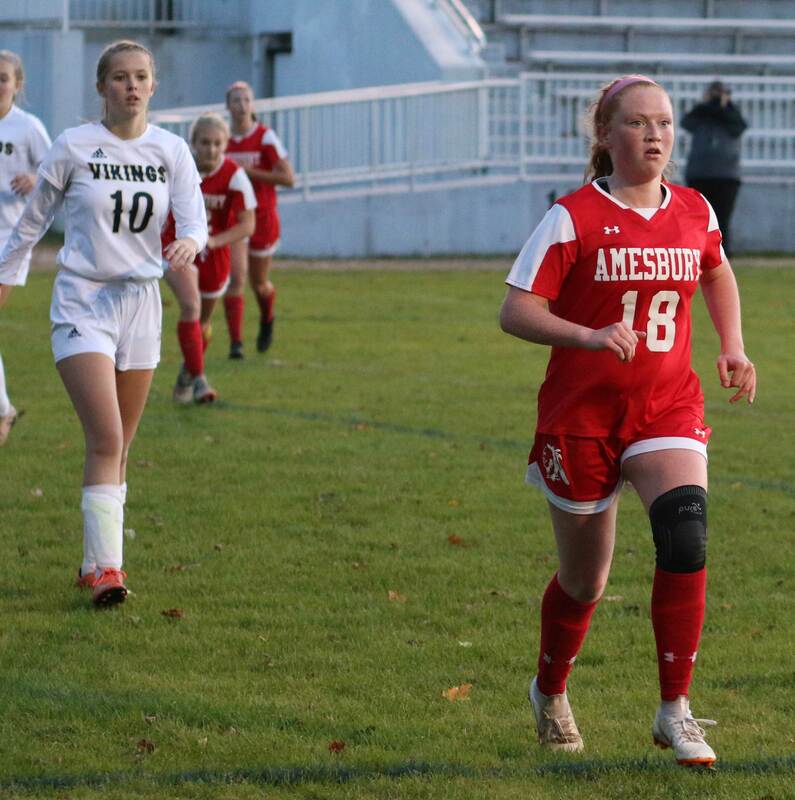 Gracie’s goal today at Manning Field was all there was as Amesbury took out St. Mary’s 1-0. 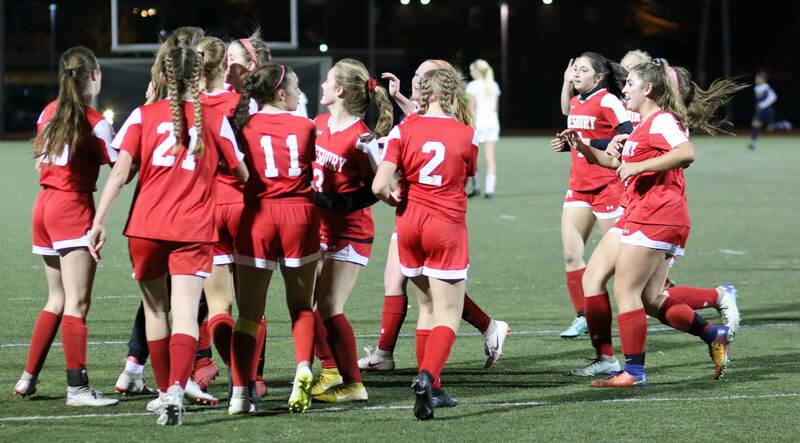 That win gets the Indians (14-3-4) into the D4 North finals for the third straight year. 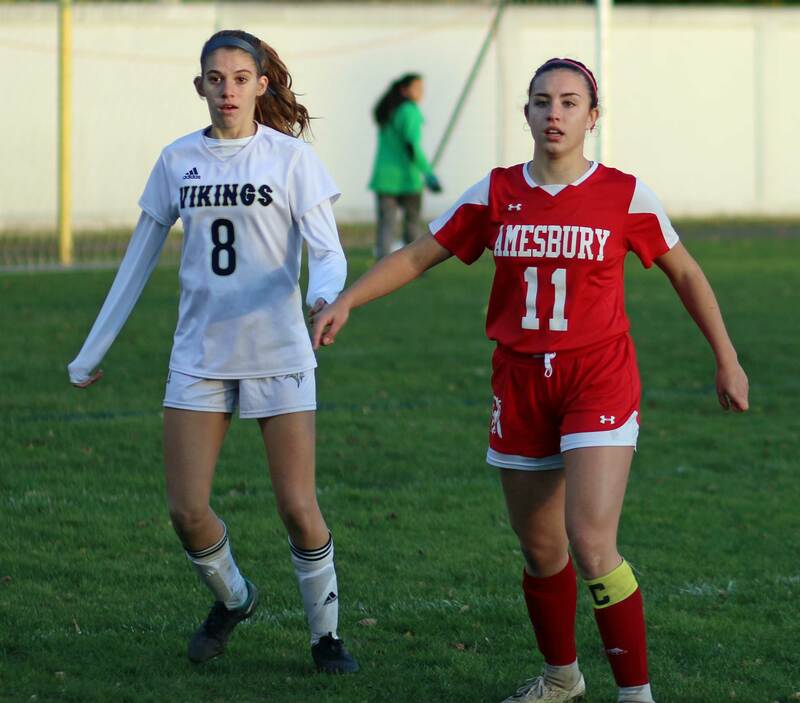 To get the state title Amesbury will need three more wins starting with the Manchester-Essex/Medway winner on Sunday at Manning Field. The Indians are undefeated in their last ten games since losing to Manchester-Essex in October. 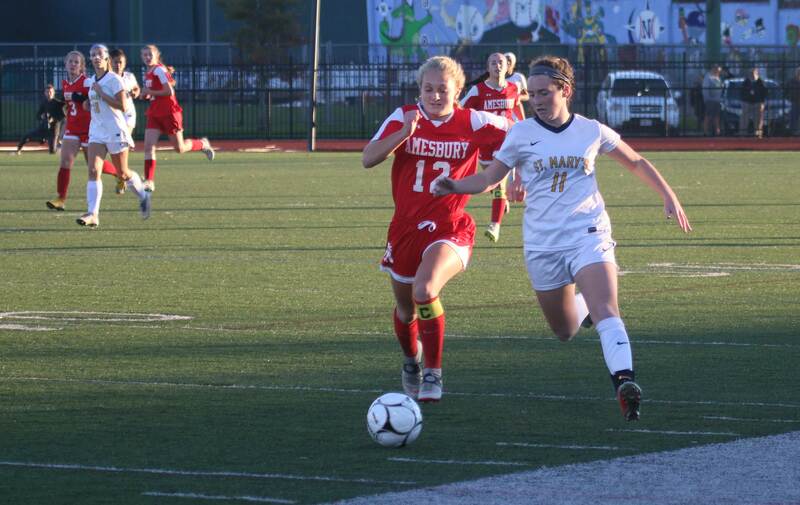 I saw St. Mary’s play Amesbury in the tournament last year at Landry Stadium in Amesbury. I was unimpressed. 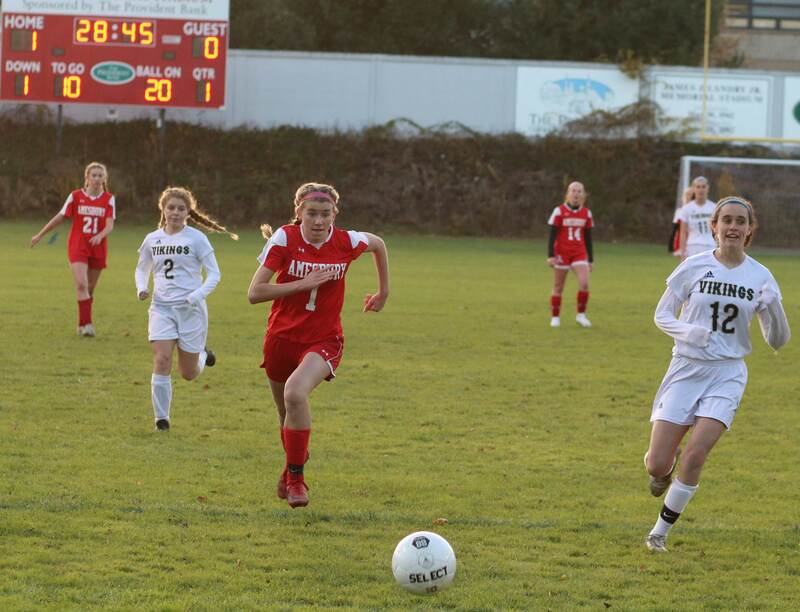 The final was only 2-0 but the Spartans displayed a game-long inability to generate any sort of an attack. Today I saw a different team of Spartans. 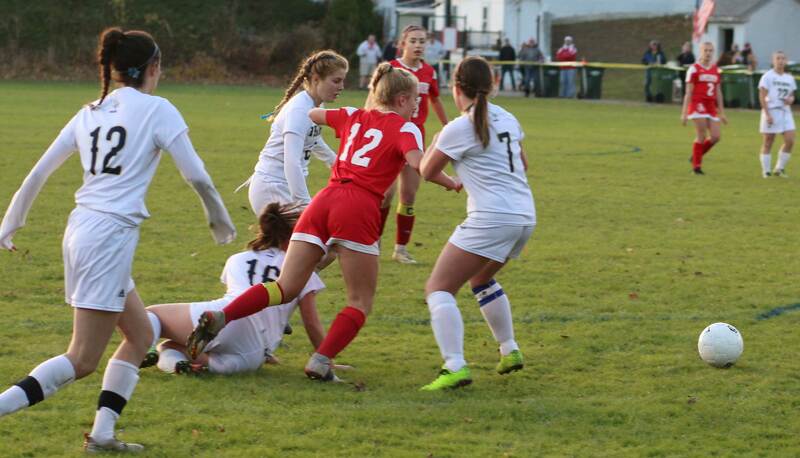 For a little over a half, the play was in the middle of the field or in the upper half of the Amesbury end. 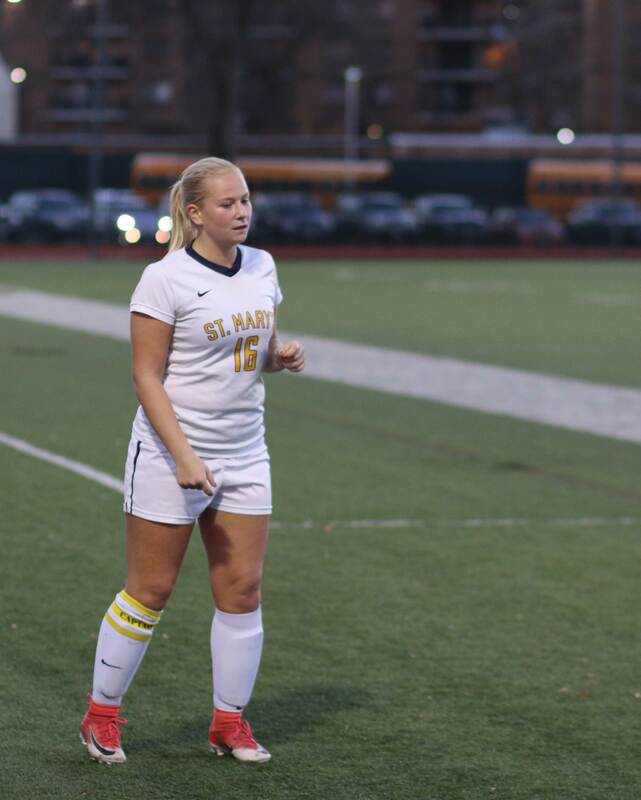 “We had a great first half, “recalled St. Mary’s coach Jim Foley. 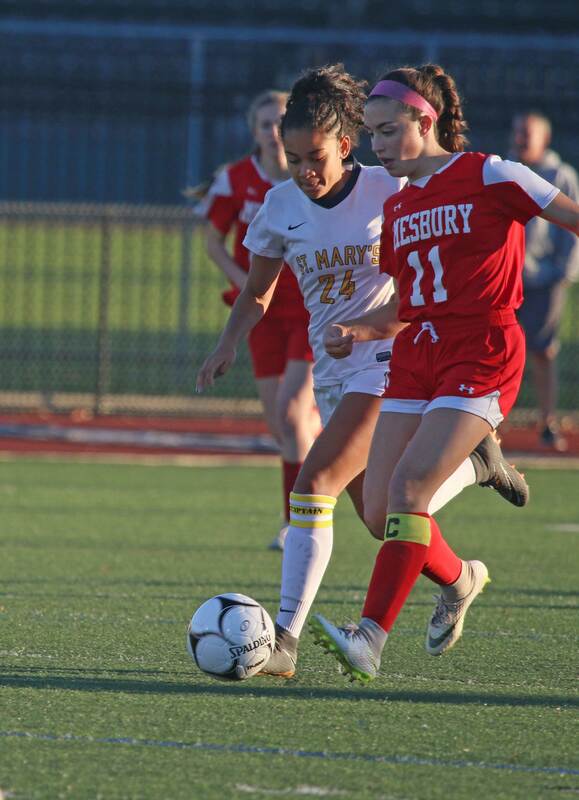 There weren’t golden chances, but the Amesbury attack was seriously limited by St. Mary’s. 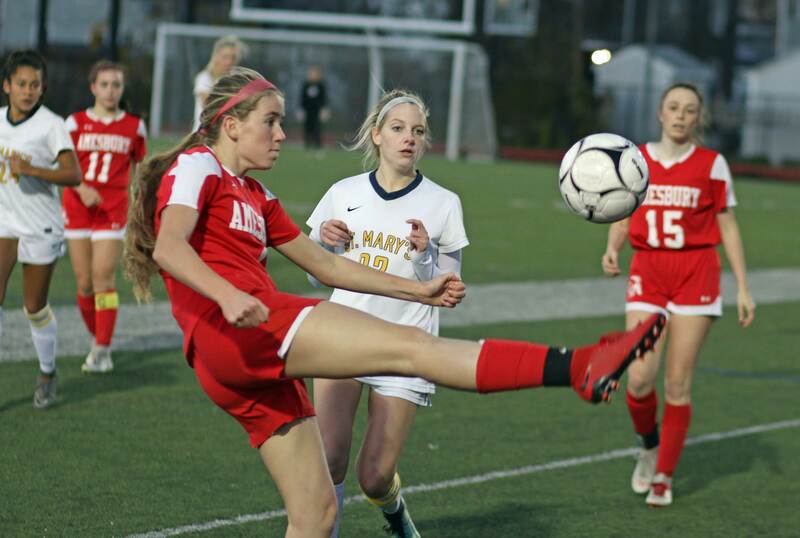 “We started off with two great chances in the second half,” said Coach Foley. 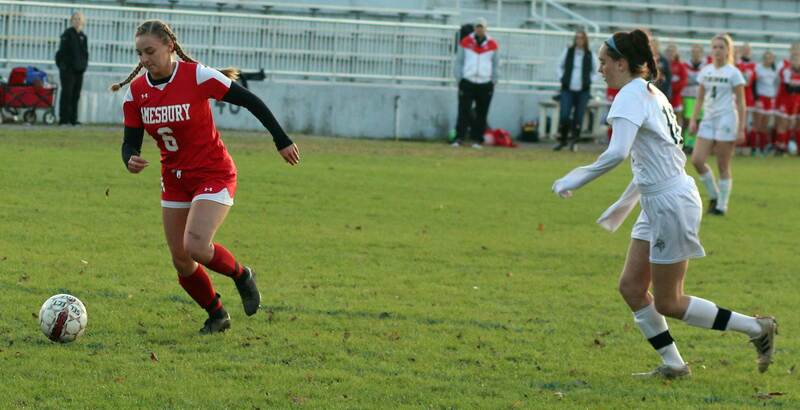 One was off a free kick by Joslyn Deschenes and the other came when Kayla Demers got in close. 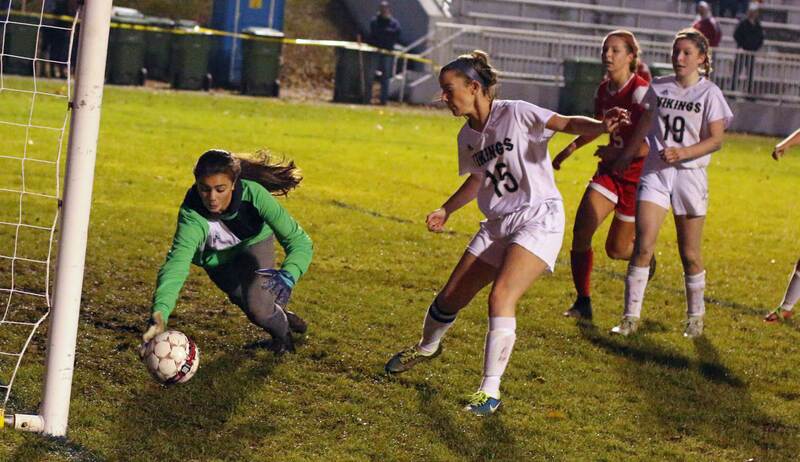 Amesbury goalie Alli Napoli handled both advances. And then Amesbury took over. 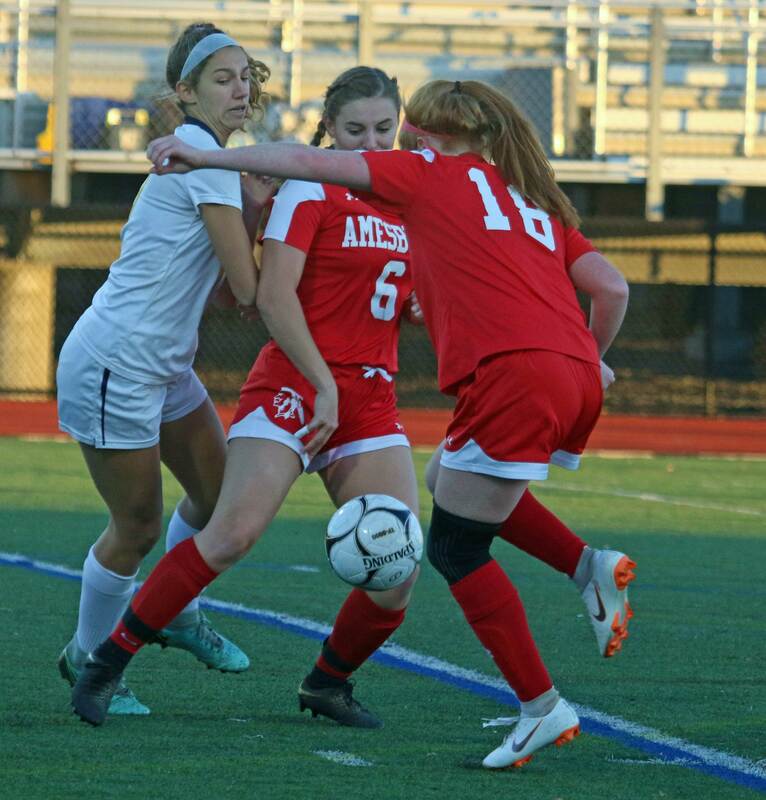 Amesbury had a great chance in close after nine minutes in their resurgent second half and then senior Emma DiPietro put two long shots on net during the next two minutes. 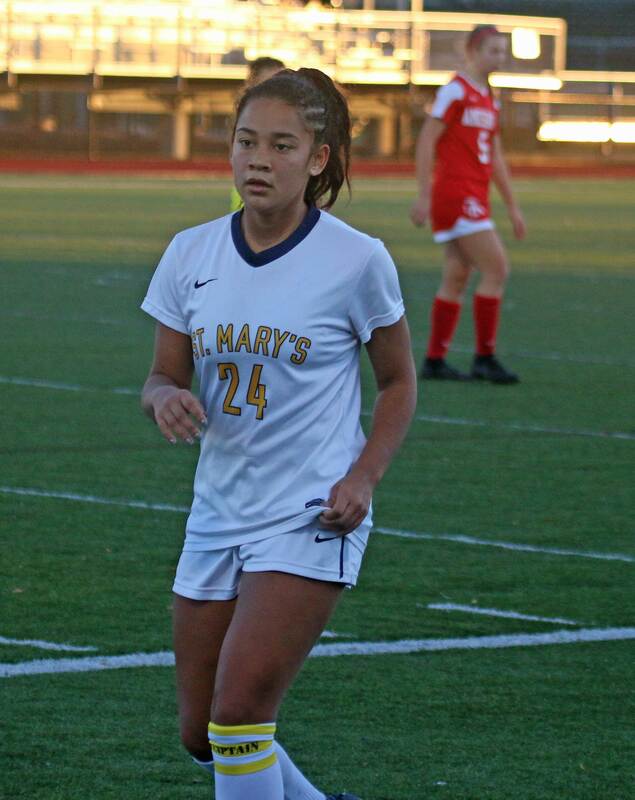 The pressure on St. Mary’s (13-7-1) was building. Every clearance was being put back into scoring areas by the Indians. The persistent pressure led to a free kick. 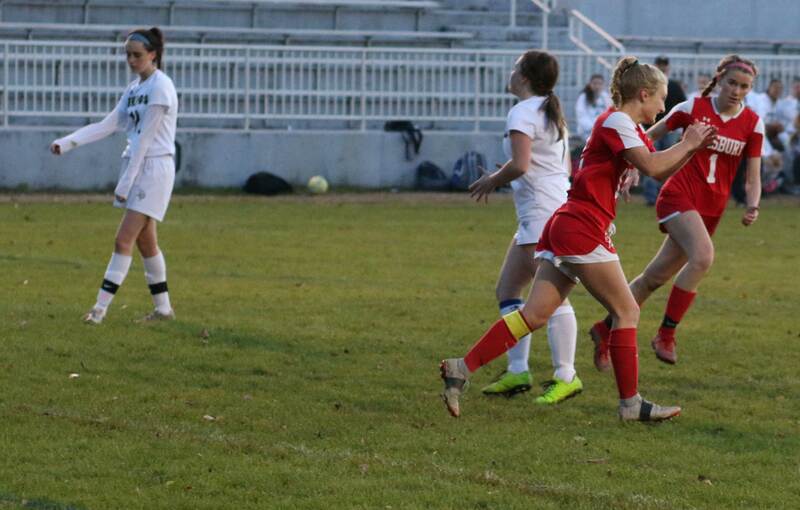 Alyssa Pettet took the kick from straight away. 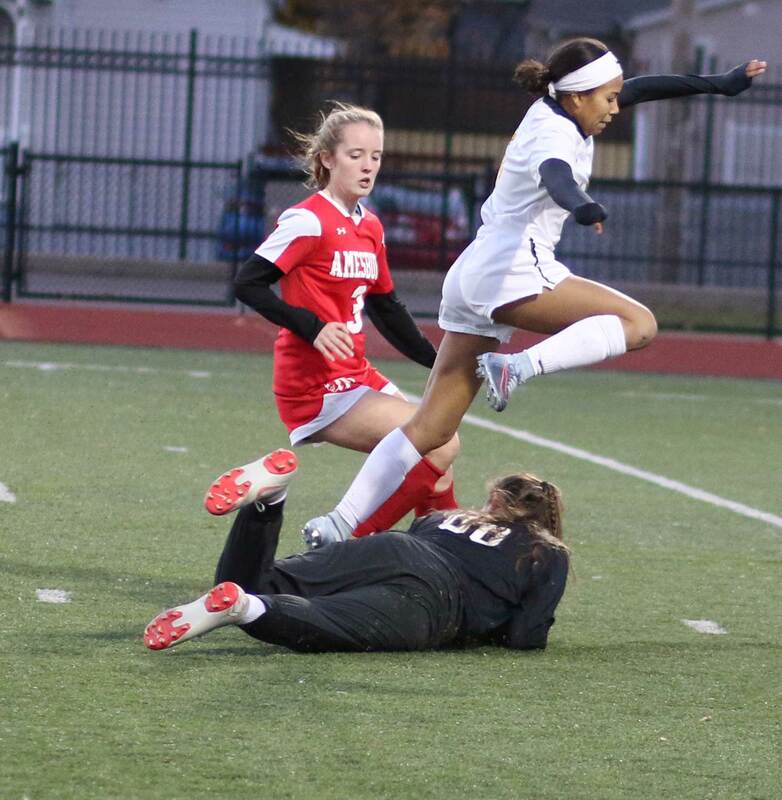 Her kick came toward Spartans goalie Adrianna Bowker. Chelsea Lynch was nearby contesting the oncoming shot. 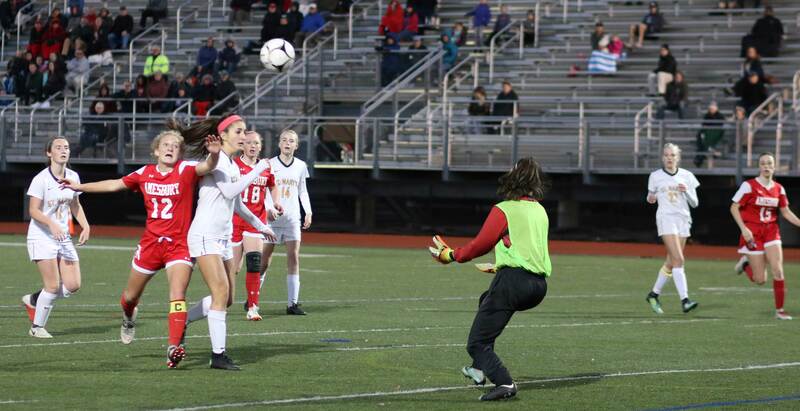 The long shot bounced off the St. Mary’s goalie and right to junior Gracie Doherty. 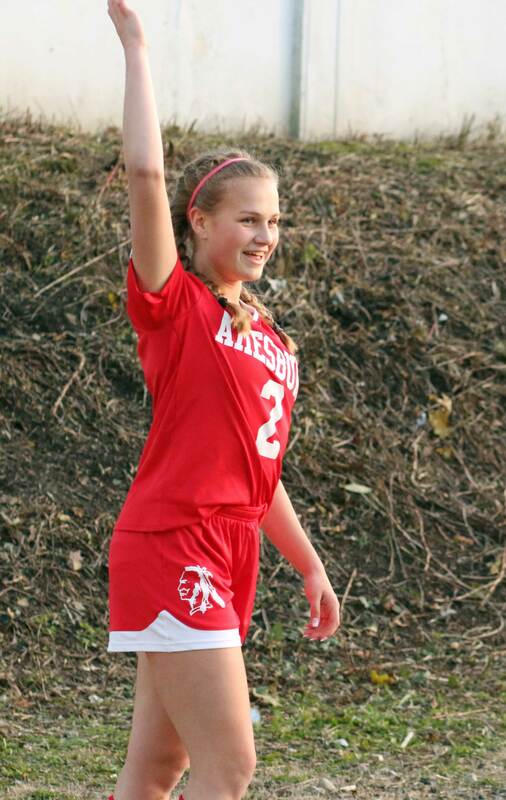 Gracie put a charge into a shot and it hit the crossbar and caromed right back in her direction. 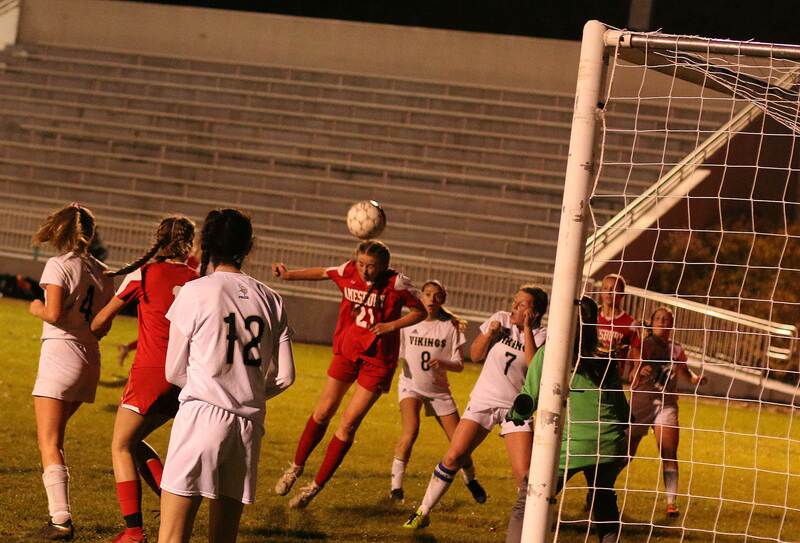 Gracie reacted by leaning into a header that settled in just under the crossbar at 27:27. I assumed that St. Mary’s would start to press Amesbury with so much time remaining. 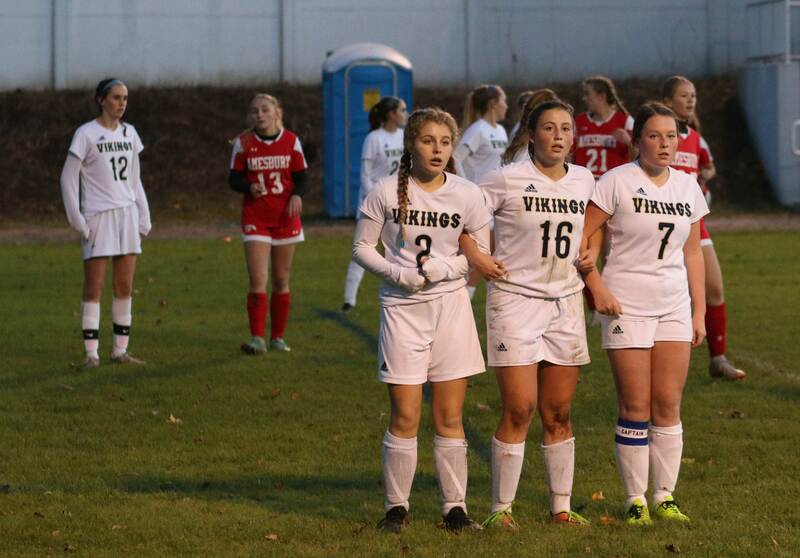 They called a timeout after the goal, but their offense never got started. “We really didn’t get any looks after those plays in the beginning of the second half,” said Coach Foley. 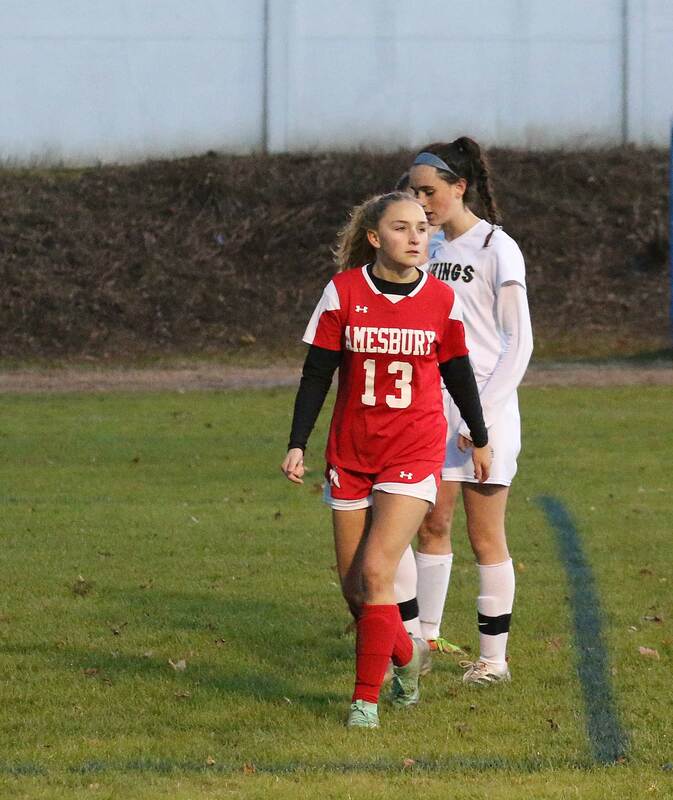 Amesbury has now shut out St. Mary’s three straight years in the tournament. They are also unscored on in this year’s D4 North tournament. It was not a lack of effort on the Spartans’ part. The Indians had that “team” thing going defensively. The long balls to no one were limited. Instead, teammates were passed to and better control kicked in. “Defense wins championships,” said Coach Thibodeau. Certainly, an advantage for the Spartans was that even though they were the lower seed (#10), they ended up with a home game late in the tournament. They have played twelve games at Manning Field this season. I was very impressed with defender Morgan Mackey in the first half. She prevented the speedy Indians from getting any breakaways. 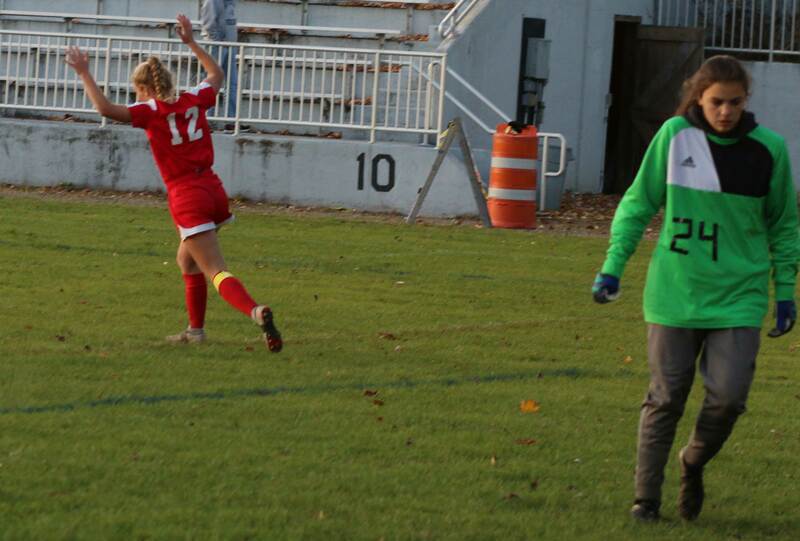 Not to be forgotten on the eventual game-winner was the terrific send-in by free kicker Alyssa Pettet. 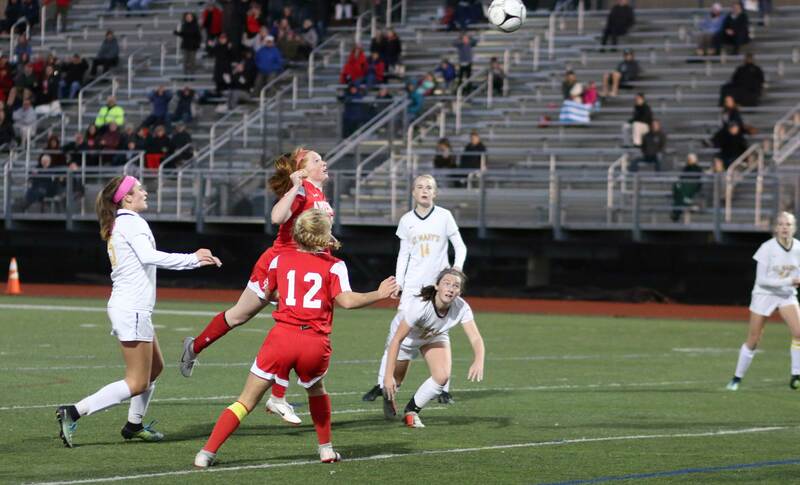 Ten minutes after the Doherty goal, McKenna Hallinan broke in for as clean a look as you could hope for. 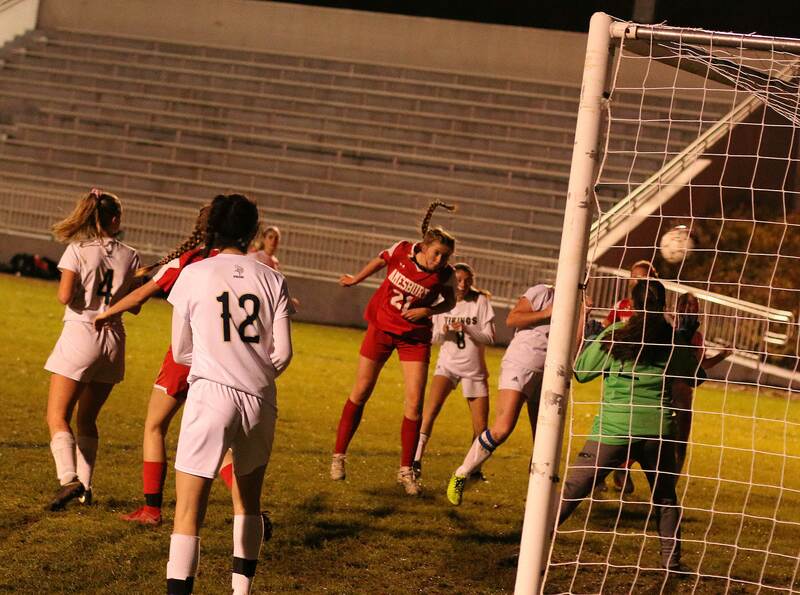 Spartans goalie Adrianna Bowker should have been arrested for unarmed robbery after she deflected McKenna’s shot wide. The parade of planes flying over, heading to Logan, always interests those of us who seldom hear/see planes of their size. Despite the 3:30PM start, there was a good crowd in the stands. 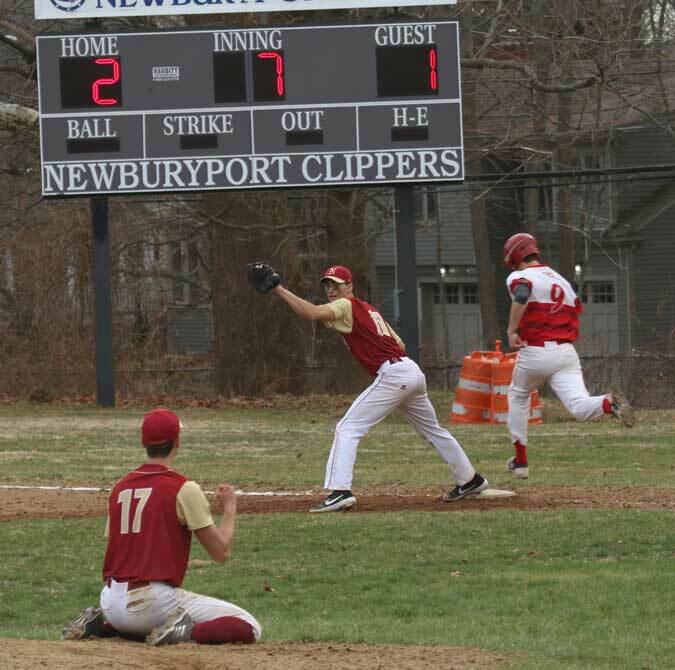 Amesbury is in the Cape Ann League. St. Mary’s is in the Catholic Central League.